Spooky '60s inspired R&B-garage from pre-Bomboras, pre-Huntington Cads, Ex-Untold Fables, an older release on Dionysus which we came across a handful of copies while combing through the warehouse. 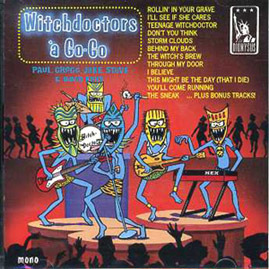 COVER ART BY SHAG long before his success...a marvelous take on "The Chipmonks Au Go-Go"! THIS TITLE WILL NOT BE PRESSED AGAIN ON LP SO THESE ARE THE LAST, REMAINING COPIES.